Robyn Vilate: camo again...why not? yes, i've realized i have a slight "thing" for camo. this is funny, because my family is a big hunting family and my dad owns more camo than i think i've seen cabela's at one time (ok. slight exaggeration, but it's a lot) so besides when we were camping, i was never big into the camo trend, until recently! everything is camo, and it has basically become a neutral. i wear it with leopard print, bright colors, stripes, you name it and camo print goes with it! also, if anyone is counting, this is my third pair of camo jeans, and i don't feel the slightest bit embarrassed about that. I am obsessed, too! I have pants, ballet flats and almost bought a camo baseball hat at Target last week. It's addicting! 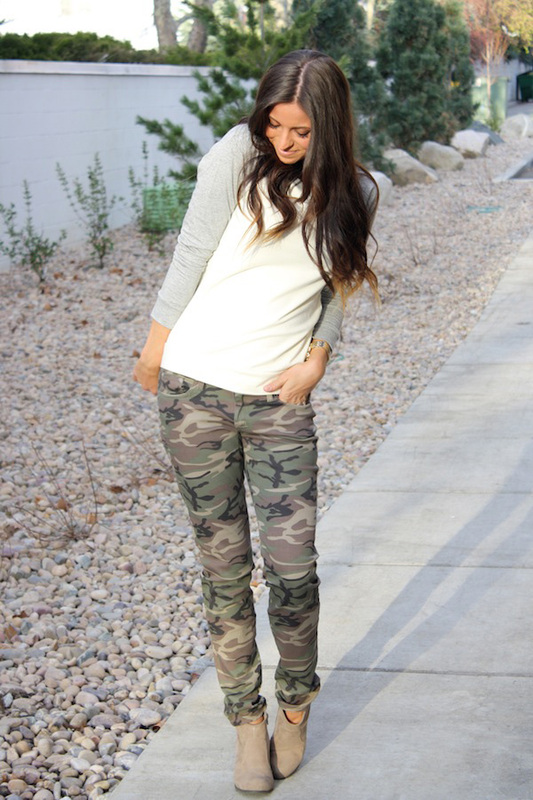 love the combo of the baseball-ish tee and the camo skinnies - perfect! It's so hard to find a great pair of camo pants! I love these! These are so great! I didn't have a pair yet that weren't ripped up, so I do love these ones. So comfy and stretchy! Love these camo pants on you! What kind of camera do you use to take your photos? gorgeous look! love ur hair! Love these camo jeans! What size dear? I love the camo look but I haven't jumped on the trend myself yet. Love this!